It seemed that each new action was being thwarted … I ordered new bank merchant facilities - still not available, extra bank accounts - charge cards went astray, new client “$”s promised but not arriving causing cashflow crisis, my ever faithful Cold Calling for Scaredy Cats seminars not selling, EDM mail senders not working, the alternate PayPal credit card machines taking at least 7 days to travel from Sydney to Perth and as I write, still not here, etc., The list is LONG!! And it seemed to me that these were all signs screaming at me to do something else. But the mist is clearing. 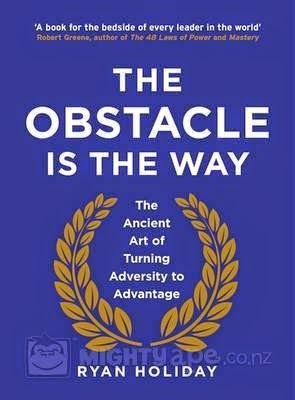 Ryan Holiday in his great book, “The Obstacle is the Way”, says the opposite. And a dark fog seemed to lift when I read those thoughts. The gate to the future is now wide open. There is always a countermove, always an escape or a way through, so there is no reason to get worked up. No one said it would be easy and, of course, the stakes are high, but the path is there for those ready to it. We know it is going to be tough, but we are ready. We are collected and serious and will not be frightened off. So we shake off the bad stuff as it happens and we soldier on – staring straight ahead as it nothing happened. If we hold our nerve, nothing really does “happen” and perception makes obstacles nothing of consequence… just stepping stones to success.